This Bulgogi Marinated Cheesesteak gives the beloved sandwich a contemporary Korean twist by marinating tender Kobe beef in a classic sweet-savory-spicy bulgogi marinade. Sensory appeal and a health-minded approach characterize this flavorful and unexpected Fresh Mango & Sweet Potato Hash. Onions, sweet potatoes and mango are sautéed with pancetta, brown sugar and red pepper flakes to create a trend-forward, colorful hash, topped with a fried egg. Stuffed with luscious, sweet lump crab, this quesadilla is the perfect vehicle for the creamy avocado partnered with a zingy chipotle aioli and fresh pico de gallo. Served warm on a crispy, toasty flour tortilla. 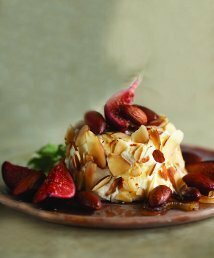 Bring a little crunch, a touch of class and a ton of creativity to your next dish with goat cheese, figs and crunchy almonds.